We apologize, but the love we are seeing for IAC products has temporarily made it tough to keep up with demand. So, for the time being, shipping times for Quick Ship products are running more like 3-8 weeks from order dates, and is dependent on our current in-house and the size of your order. We hope to get this back to our normal lead time soon. Thank you. Products offered in the Quick Ship program are shipped (based on quantities not to exceed ten units) on or before the fifth working day after receipt of order (ARO) – Normal lead times for Quick Ship are five (5) business days ARO, however all quick ship product requests are subject to availability and sometimes experience lead times between 5 – 10 business days. Quantities greater than ten (10) units are subject to review by factory before assigning ship dates and approval. 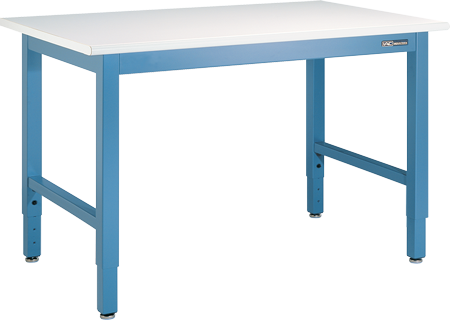 The Basic Workmaster™ Stock Bench offers a broad selection of easy-to-assemble workbenches for assembly, lab and technical environments. A variety of optional drawers, cabinets, mechanical and electrical components allow easy customization. For more info on Quick Ship, choose the "Expedited Shipping" tab.